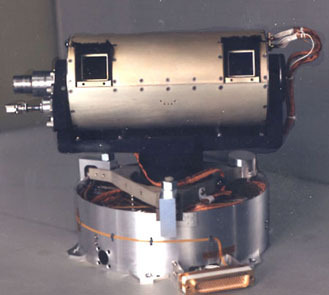 The Imager for Mars Pathfinder (IMP) is the lander camera on the Mars Pathfinder mission. However, it is a little misleading to refer to the IMP simply as a camera because it is actually a very important part of the Pathfinder mission, and the images it provides are much more than simple souvenir snapshots. The IMP will provide much of the science knowledge to come from the Pathfinder mission. When the Pathfinder landed on Mars, the IMP's first job was to locate the sun. The camera head, which is able to rotate 360°, rotated until the sun came into view. This operation was crucial to the mission's success. The bumpy nature of the Pathfinder landing was such that when the lander "awoke" with the sunrise, the engineers controlling the spacecraft could not not know which direction it was facing. 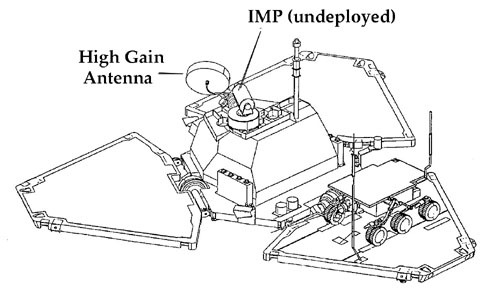 The IMP had to find the sun so that the lander's computer could direct the high gain antenna in the right direction. This antenna transmits the data from Mars to the mission control team here on Earth. If the sun-searching operation was unsuccessful, the Low Gain Antenna would have been employed, and the data rate would have been much slower. After locating the sun, the IMP took a panorama of the landing site. The IMP takes images one small tile at a time, and then these tiles are combined to make a panorama. Sometimes the boundaries of these individual tiles are very visible. This was especially true for the first images that were seen after the Pathfinder landing. These images were thrown together very quickly, so that they could be released to the public immediately. This means that they were not corrected for parallax. This portion of the "mission success" image shows the effects of parallax very clearly, especially in the area of the rover wheels. Parallax is the term given to the optical illusion that occurs when your eyes scan across a given scene. As your angle of view changes, objects in the foreground appear to move with regard to the background. You can understand this phenomenon better by experiencing it -- focus your eyes on an object that is close to you -- like your fingers and alternate closing your right and left eyes. When you view the object with your right and then your left eye, the object will appear to have moved against the background, because you will be looking at it from a different angle. Each of the individual tiles is actually an image in itself, with its own parameters. For each small frame decisions had to be made about what filters to use. The first large image that we saw on July 4th was called "mission success," because it signalled the beginning of a successful mission. Before the landing, the content of the mission success image was hotly debated, because different segments of the Pathfinder team all had their own special interests. The image had to be useful for the assessment of spacecraft health, and rover navigation, and it had to be something that would appease the general public's (as well as the scientists') curiosity, and it had to be retreived quickly. This is the color portion of the image that was finally decided on. The areas directly to the right and left of the rover petal were visible (which allowed the rover team to make the decision not to immediately deploy the rover), and it was in color -- which the scientists thought would satisfy everyone's natural curiosity about Mars. On July 4th, the first images were taken before the IMP was deployed. Within the cylinder under the IMP's head is a "pop-up"mast. For the seven month journey to Mars, the mast was in a stowed position. Before deployment, the IMP took a full panorama of the landing site, refered to as the "Insurance Pan," because if something went wrong during deployment, we would still have a full panorama to retreive, and the mission would not have been a waste. Once the IMP was deployed on its mast it could "see" the entire landing site. Not only does it rotate horizontally, it can also rotate vertically. However, once the mast was deployed the height of the IMP was no longer variable. Once deployed, the IMP could not return to its stowed position. The IMP is a "camera" but it does not record its images on film. 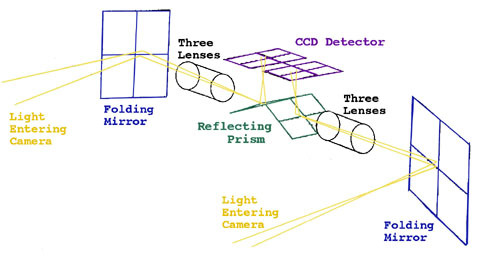 Instead, light travels through the windows, reflects off mirrors and prisms, passes through filters and lenses, and is projected onto something called a CCD detector. Each individual block that you see represents one pixel, and each of these pixels is created by using binary code which tells exactly how much light fell on that area of the CCD detector. This information is then transmitted to earth by the high gain antenna. The data comes back quite slowly, simply because there is a lot of information in one image. Full color images take longer than one color images, because the color data are taken separately and then must be layered onto one another. Different colors are taken with different filters. To make a color picture requires red, green and blue data. In fact, the filter wheel is one of the most important elements of the camera. It is the filter wheel that provides most of the scientific value of the images, and it is the filter wheel that allows the scientists to create color and 3-D images. This wheel contains twenty-four filters, each of which has a specific purpose. In this drawing, the filter wheel is shown in blue. Each image that the IMP takes must be carefully orchestrated. For each tile of pixels, scientists must determine which filters best suit their purpose. What the scientists would like to see must be balanced with the downlink time -- that is, the time that it takes to receive the transmission from Mars. In order to create stereo or color images, different images must be layered on top of one another. Of course scientists would have loved to downlink a complete panorama of the landing site in full color and stereo, but that would have been impossible -- the data simply could not come back that quickly. The twenty-four filters can be broken up into categories, although some of them, such as the stereo filters, do overlap. Twelve of the filters in the IMP are used to examine the geology of Mars. These filters rely on the fact that different minerals reflect varying colors (wavelengths) of light. Some of these subtle differences may not even be visible to the human eye, but individual filters can be "tuned" to specific spectra (colors of light), in order to make them very visible in the images. Geologists have made predictions about what minerals can be found in the area, and the filters geology filters have been picked accordingly. 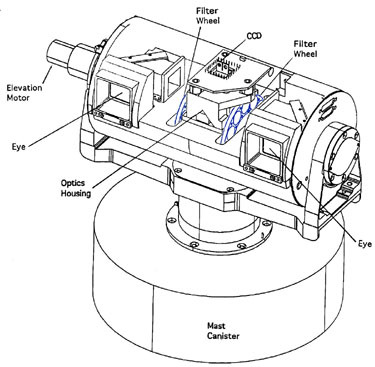 Eight filters are included in the camera to enable scientists to look at the atmosphere. Mars's atmosphere is primarily carbon dioxide, much thinner than our own atmosphere, and extremely dusty. With the atmosphere filters scientists hope to determine how much dust is in the air and what it consists of, as well as the amount of water vapor. There is another filter which has to do with dust, the diopter filter. The Danish collaborators have made special magnets, whose purpose is to collect dust in the atmosphere. The diopter filter will enable the IMP to have a high resolution view of the dust which collects on these magnets, and scientists will be able to determine what percentage of the Martian soil is magnetic by comparing the color of the magnetic dust with the color of the soil. The IMP's two "eyes" are what enable scientists to create stereo (3D) images -- that is, images which demonstrate the depth of a scene. These images have more than entertainment value, they make it possible to gauge distance with a technique called "range-finding." The right eye and left eye image are superimposed on one another, and the distance between a rock seen by the right eye and the same rock seen by the left eye reveal the distance to the object. This will be very useful in assisting the rover's navigation. With this data, in fact, collaborators from the United States Geological Survey will be able to create a topographical map of the area. Send us your questions about the IMP!